Look. You can’t expect me to be dispassionate about jumping spiders. No one can be. They’re the dolphins of the arthropod kingdom. How do I love them? Let me count the ways. 1) Their looks. Hey, looks count. Unusual among spiders, jumping spiders are flashy and showy. Males have chelicerae that are bright and iridescent, with exotic colors. But there’s much more. Humans have evolved to respond to certain facial features — it’s innate, we can’t fight it. Jumping spiders pull all our strings. They have these big, appealing eyes, like eight-legged, eight-eyed chocolate lab puppies. You can’t say no to a jumping spider when it turns its charm on. 2) Their athleticism. Jumping spiders can leap up to forty times their body length. I can’t. 3) Their intelligence. Jumping spiders are known to sight their prey, mentally map out the best path to reach their target, then follow that plan — even if that involves losing sight of the prey en route. This involves foresight and planning, which is a pretty impressive piece of higher cognition from something the size of a thumbnail. 5) But most of all: their attitude to us. Let’s face it, we’re a lonely species. How many friends do we have, really? Most species regard us in one of three purely utilitarian ways: indifference, prey or predator. 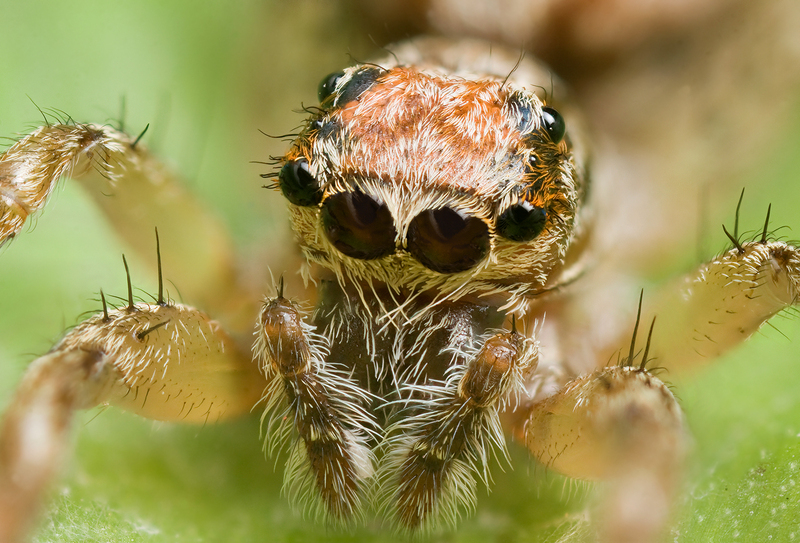 Jumping spiders are a rare breed that reacts to us with: curiosity. To put it another way, when we’re looking at them, they’re peering back at us. This dangles the promise of friendship at us, and we’re suckers, we can’t resist that. Search on the web for photographs of jumping spiders, and one point jumps out: unlike nearly all other wildlife photos, the jumping spiders are overwhelmingly facing the camera. There’s a reason for that — the spiders were curious about the photographer and the camera, and turned around to get to know them better. You will find all of that in the encounter Akash and I had with this one, a sitticus pubescens. It was early spring, but a very warm day. The location was on the play structure on the grass lawn, with corners and angles, which from what I understand is perfect for this species. I don’t know much about sitticus pubescens, but would like to learn more. I think it was a male, from the swelling of the pedipalps at the end, but am not sure — other photos do not show as nearly as pronounced a swelling. But do you see what I mean about a puppy dog look? If I could imitate that gaze, I could get away with a lot more. Their 4-2-2 eye pattern, with the middle two of the anterior row being huge and the two in the middle row being tiny, is unmistakable.